← What are we teaching our children? As of last night, it’s official: I lost my daughter’s lovey. His name is Pink Doggie. The “Pink” refers to the color he once was, when he was new. My mom bought him in the hospital gift shop when Baby Sis was born, and Pink Doggie (a.k.a. “P.D.”) has been a member of the family ever since. Over the past 17 months his original pink faded to a dirty color closer to brown, and his pungent odor was a punch line around the house. It wasn’t possible to wash him, other than by hand, which wasn’t very effective. But Baby Sis loved him dearly, smell and all. She would hold his fragrant ear up to her nose as she went to sleep every night, or when she needed to be comforted. He was her best (non-human) friend. I had read horror stories about loveys being lost. I had heard advice about keeping a back-up lovey, just in case; writing down the name of the manufacturer; and cautionary tales about how you should never, ever let a child’s lovey out of the house. Carelessly, I disregarded all of that advice. So it was probably inevitable that we lost him yesterday, somewhere on the streets of Brooklyn, rushing between day care and school and dance class and home. We didn’t realize he was gone until bedtime. A frantic search of the house and car ensued, which wasn’t uncommon — but always before, we had found him. This time, when we looked in the oven of the play kitchen, or in the empty boxes of the wine rack, or under the Baby Sis’ car seat, he was nowhere to be seen. I called around to the contacts we’d seen that day, and even posted an “SOS” on the Facebook page for parents in the neighborhood. No dice. G asked me to write down every place we went that afternoon so he could go search. I produced a detailed itinerary of our afternoon and he set off into the darkness, flashlight in hand. N also took out her Dora flashlight to continue searching every nook and cranny in the house. I rocked Baby Sis in her room, whispering reassurances and hoping she’d fall asleep without him. I tried giving her a few different stuffed animals, but she rejected them all by throwing them onto the floor. I knew that losing P.D. wasn’t the end of the world, but it was still sad for Baby Sis and for our whole family. I had the comforting thought that maybe a small-scale loss isn’t such a bad thing for the girls to experience — maybe smaller disappointments can help prepare you for the inevitable bigger ones in life. In any case, G came home a little later, doggie-less. We put both girls to bed, and at first Baby Sis went to sleep. Unfortunately the night turned into a very long one, with Baby Sis waking up every few minutes between 11:00pm and 3:00am. Sometime around 2:00am, Baby Sis reached for a different stuffed pink dog that I had brought into her room earlier. She had rejected it before, but now she seemed to want it. She cuddled with it a little and took it to bed with her. When she finally fell asleep, it lay beside her. At that point, the search seemed fruitless, and I was nearly resigned to giving up the mission. There was one thing I wanted to do first: look online. 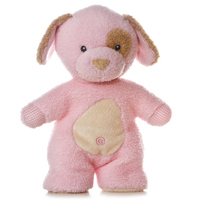 Back at home, I jumped on the computer and Googled “stuffed pink dog” and “plush pink dog,” to no avail. While I was searching, I got an email from my (amazing) mom: she had found the manufacturer and the website (how, I do not know!). When I looked, I saw him — Pink Doggie!! Immediately I ordered two, and bookmarked the manufacturer’s website. Both P.D.’s should be here in a few days. I’m curious to see whether she accepts him, now that he will be clean and new and not smelly, and after it must have seemed that he abandoned her. 1) Losing a lovey is sad, but it’s not a tragedy. Over the past couple of nights I’ve been watching Ken Burns’ documentary on the Dust Bowl, much of which centers on my ancestral homeland of Oklahoma. Huge clouds of dust enveloping homes, hunger, plagues of grasshoppers and kids getting sick with dust pneumonia — that is a tragedy. And it could always be a lot worse. I was embarrassingly reminded of that fact when speaking to a work acquaintance over the phone today. I was telling her our woeful Tale of the Lost Lovey and how I was trying everything I could to recover him. Realizing I was sounding a little whiny, I asked if she’s headed home for Thanksgiving. “Well, not exactly,” she responded, and went on to tell me that her parents’ home had been flooded during Hurricane Sandy and all their possessions were pretty much wiped out, so they were getting together at the home of a relative for Thanksgiving dinner. Ouch. That put my lovey-story into stark relief. 2) My daughters — and our family — will be fine no matter what happens, as long as we have each other. N was wonderful with Baby Sis last night, taking care of her and even offering her own stuffed animals as replacement loveys. At one point N produced a poster and hung it on the wall; it says, “O pink dogge, wer are you?” and “Sadie loves you!” I am happy and relieved to see the sister-bond forming, and hope it is lifelong. 3) I need to slow down and take better care of the important things, like children and their loveys. So often I get caught up in the daily rush and move too fast. I forget something or neglect something. I was already feeling this way before I lost P.D., when I had a dream that I had left Baby Sis in her stroller in the middle of a parking lot to go check on a job (strangely, I was in charge of hiring a contractor to pour a concrete floor in a huge warehouse owned by Ron Swanson from Parks & Rec). In the dream I spent longer on the job than I should have, and when I rushed to check on Baby Sis, she was crying for me in her stroller, in the middle of a parking lot. I know it was just a dream, but it felt way too real. Anyway, that’s our Saga of Pink Doggie. If on this Thanksgiving Eve I were to say what I’m most thankful for, it would be that our family is together and strong enough to weather anything. This entry was posted in Bedtime, Parenting and tagged Aurora, Dust Bowl, Hurricane Sandy, Ken Burns, lovey, Parks & Rec, plush toy, Ron Swanson, Thanksgiving. Bookmark the permalink.